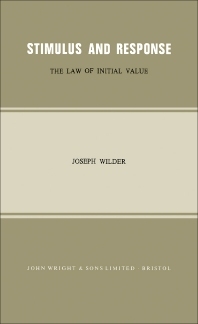 Stimulus and Response: The Law of Initial Value provides an introduction to the study and application of the Law of Initial Value (L.I.V.). This book discusses the general considerations in the L.I.V. Organized into eight chapters, this book begins with an overview of the L.I.V. as a biological law since stimulus and response are common to all biology. This text then explains the discovery and study of the L.I.V., which originated in a study of the autonomic nervous system. Other chapters consider the role of L.I.V., which is important in any kind of non-specific therapy than in specific therapy and for the on-specific effects, often called "side-effects", of specific therapies. This book discusses as well a series of examples of the application of L.I.V. to physical stimuli. The final chapter deals with the social significance of L.I.V. This book is a valuable resource for psychologists, sociologists, scientists, pharmacologists, physiologists, neuropsychiatrists, and internists. VIII.—Does the L.I.V. have a Social Significance?